At Savannah Country Day, each student lives by the motto, Service Through Knowledge and Character. That’s why community service is an essential component in the education of each Savannah Country Day student. Service learning gives students the chance to see beyond themselves and their close-knit families and groups of friends to see the larger world of which they are a part. Community service experience also serves to reinforce what is learned in the classroom. But service isn’t a requirement. It’s an expectation. And our students never fail to meet that expectation. Whether it’s organizing a blood drive and then lining up to donate, or traveling over spring break to build houses with Habitat for Humanity, our students treat their community service commitments with the same determination and professionalism that they treat their studies. And just as the rewards reaped from diligent study and high academic performance are many, so are those reaped from helping others. Perhaps even greater, if you ask our students. Junior kindergarten students collaborated with members of the One Love Club on Wednesday, February 20 and Friday, February 22. 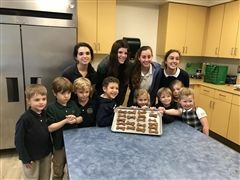 The students made dog biscuits to bring to our furry friends at One Love Animal Rescue, which is an organization that helps abandoned, neglected, abused and unwanted pets in the Savannah, GA area by partnering with shelters, rescue groups and the community to facilitate adoption of these animals into permanent and loving homes. Hornets are spreading the LOVE! Continuing their support for Wesley Community Center Preschools, a seventh grade team participated in the Wesley Love Walk on Saturday, February 9. The grade raised over $400 to help their friends at Wesley. Way to go, Hornets!! Students in the Ronald McDonald Club are participating in the Adopt-A-Meal program, in which they provide a hot meal and much-needed support service to families who are taking care of their sick children. On Sunday, they whipped up a brunch spread for the families, including pancakes, fruit salad, sausages and muffins! 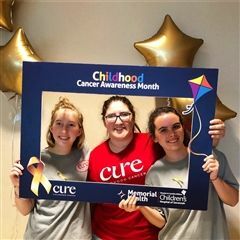 Members of the CURE Club volunteered at an Ice Cream Social at Memorial University Hospital as part of National Childhood Cancer Awareness Month. More than 300 guests stopped by to enjoy ice cream and help support the cause. 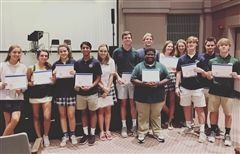 Upper School students who served as Horizons volunteers this summer were recognized at morning assembly on August 31. This group collectively served more than 1,500 hours for the organization! Horizons is a summer enrichment program that provides students from low-income families in the Savannah area academic, cultural, and recreational opportunities designed to help close the achievement gap by preventing summer learning loss and encouraging academic growth. Congratulations to Lily Glass, Morgan Meyer and Zoe Rehman who were presented with The Landlovers Merit Awards on Wednesday, May 16! 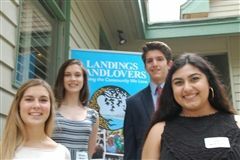 The Landlovers Community Service Merit Awards recognize Landings high school seniors who go "above and beyond" in giving time and talent through community service. Commitment, creativity, leadership, and total time dedicated determine the winners. 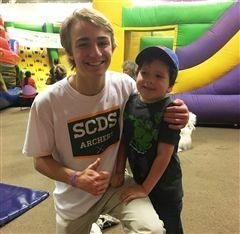 When Sawyer Smallwood ’18 was researching ideas for his Eagle Scout Service Project, the Little School at Country Day jumped out at him — what better way to serve the community than at his very own school? Sawyer met with Director of the Little School Pamela Connor to discuss the School’s needs, and new outdoor play structures was one of them. Sawyer devised a plan and, with the help of his father and some friends, built a set of benches, balance beams and a large “mud kitchen” for the little ones to use and enjoy. Over the last seven weeks, Upper School students Emma West, Caroline Gilpin, Rachel Mascolo and Vik Manocha (pictured above) have been working hard to raise money for the Leukemia and Lymphoma Society as part of their Student of the Year Campaign. Rachel and Vik were the runners-up, raising at total of $31,000. Caroline and Emma also did well, raising approximately $16,000. Together, these four students raised approximately 30% of the total funds raised over the last seven weeks ($152,000 across a total of 11 teams). 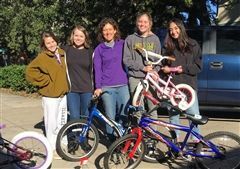 Members of The Real Environmental Enthusiasts (TREE) joined forces with Savannah Bicycle Campaign to make a big difference this holiday season. Students spent their Sunday morning cleaning used/donated bikes to give to children in need. With a little bit of soapy suds, elbow grease and lots of love, these bikes looked good as new and are sure to make lots of children happy this season of giving! Hornets were honored at the United Way of the Coastal Empire Hands On Savannah Volunteer Awards! Students in the Horizons Youth Volunteers won the 2017 Education Volunteer of the Year Award! Junior Kindergarten Hornets have gone to the dogs! 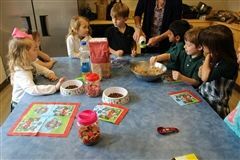 Students are heading to the kitchen to make dog biscuits for One Love Animal Rescue, a favorite yearly service project! These tasty treats will fill the bellies of hungry pups that are waiting to be adopted. The handmade biscuits will be presented to One Love, along with donated blankets, handmade peanut butter treats, and pet toys. Our students combined flour, chicken stock, and lots and lots of love to this recipe for their furry-friends--and even pretended to be puppy dogs with some treats of their own! 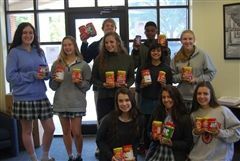 Over the weekend, several Upper School Hornets took part in the new service initiative, UTime. The organization was created by Lily Glass '18 to provide families with children with special needs a free and dependable babysitting service. Not only does this help the parents by giving them much deserved personal time, but the children enjoy their experience in a fun and relaxed atmosphere. UTime is one of the new student-driven service clubs at Country Day! 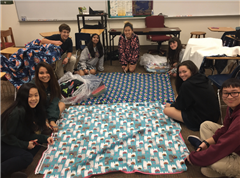 Upper School Hornets have joined forces with Project Linus, an organization that makes blankets for ill and traumatized children! Members of the Service Club will come together on a regular basis to create the blankets from beautiful pieces of donated fabric. It's a great and simple way for these Hornets to create care in our community! The 2016 Second Harvest Protein Food Drive was a huge success! This year, students donated nine HUGE bins of protein items, which will be used in crafting meals in the upcoming holidays. SCDS is proud of its 20+ year partnership with Second Harvest of Coastal Georgia! Thank you to all who donated!